While the Black Panther party in Oakland was just getting started, across the Bay in San Francisco, in April of 1967, the "Summer of Love" was just beginning. 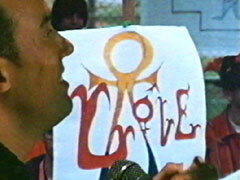 While the message in Oakland was one of "Black Power", in SF it was "Free Love" and it was that message that brought tens of thousands of young Americans to the Bay area. While the differences between the two movements were apparent, the similarity in anti-war sentiment and equal rights also existed. Young people were drawn to the drug culture in SF, which the Panthers were completely opposed to, but they were also drawn to the same radical thinking as the Panthers. The "Quotations of Chairman Mao" and the "Red Book" were two communist manifestos that rang true with both groups. The Panthers were quick to spot the similarities between the communities and Newton & Seale would use that to their advantage and begin working with white radical groups who held similar ideals as their own. Shortly after the "Summer of Love" ended, Newton was arrested and charged with Murder and it was the alliances he had forged with white radical groups that helped with the "Free Huey" movement. By the time of the major "Free Huey" rallies in 1968, many of the white radical leaders such as Abbie Hoffman, Jerry Rubin and Tom Hayden were working alongside the Panthers in their anti-war efforts and protests to "Free Huey".